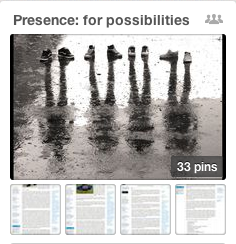 "Presence - for possiblities" was out theme for August. We enjoyed sharing our blogs this month, and offer a flavour of what we blogged about this month. Read more for full blogs! Please share your thoughts or comments with us, or just let us know you liked the blog, as we like to hear your thoughts too. Focusing on presence for possibilities provided a rich arena to understand how to cultivate and invoke presence amongst oneself, those whom we have relationships with, and lead. It's also about how we perceive time, and how we hope to make the most out of it. Importantly, being present helps us to find creative ways to resolve challenges that are urgent now.